MPs have voted to back the government's plan to start formal talks on Brexit by the end of March next year. They also supported a Labour motion calling for Parliament to "properly scrutinise" the government in its proposals for leaving the EU. 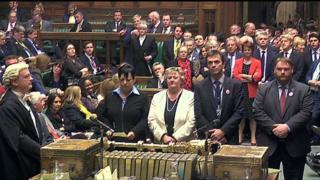 The votes followed a compromise between Labour and the Conservatives, who had argued over the questions to be put. The House of Commons' decisions are not binding on ministers. MPs backed Labour's motion, saying the government should publish a plan and it was "Parliament's responsibility to properly scrutinise the government" over Brexit, by 448 votes to 75 - a margin of 373. This followed another vote over the government's amendment to the motion, which added the proviso that its timetable for triggering Article 50 of the Lisbon Treaty, getting formal talks with the EU under way, should be respected. MPs backed this by 461 votes to 89 - a margin of 372. Within minutes of the vote, one dedicated Brexiteer had labelled it an historic moment. Iain Duncan Smith said for the first time the majority of parliamentarians had voted to leave the EU. Technically MPs have only backed the government's plan to start the process of leaving by the end of March next year. Nonetheless it is a statement of Parliament's intent. Some have accused pro-Remain MPs of wanting to backtrack on Brexit, but tonight's result shows most parliamentarians are willing to respect the result of the referendum. Instead the arguments are over exactly what Brexit will mean and the extent to which Parliament will have a say in shaping that. In that respect, both the government and the opposition will claim victory over tonight's result: Labour for getting the government to agree to publish a Brexit plan of sorts which will be subject to scrutiny, ministers for getting MPs' backing for their timetable. This was not a binding vote, but for both sides it counts. With further parliamentary skirmishes inevitable, positioning and political power play are vital - especially when the stakes are so high. After Labour proposed its motion, Prime Minister Theresa May had reportedly faced a rebellion by up to 40 Conservative MPs. So, on Tuesday she offered to support it, in return for the Labour leadership backing a compromise government amendment to support the Brexit timetable. Image caption Labour's Sir Keir Starmer said ministers had refused to give details "on every occasion"
During Wednesday's debate, Labour's shadow Brexit secretary Sir Keir Starmer said the government had refused "on every occasion" to give details of its plans, saying information about its negotiating stance was important because it "sets the scene" for Brexit. He said there must not be "a situation where the government seeks a vote in a vacuum, or produces a late, vague plan". But Brexit Secretary David Davis responded: "The simple fact is that the mandate (in June's referendum) was to leave the European Union - full stop. We need to keep that in mind when we are going through that process." He added: "This is a negotiation; it's not a policy statement. And, therefore, where you are aiming for may not be the exact place you end up." The government's amendment was opposed by 23 Labour MPs and one Conservative - former chancellor Ken Clarke. Five Liberal Democrat MPs, three Plaid Cymru MPs and 51 SNP MPs also voted against it. Ms Siddiq, Ms West and Mr Zeichner all serve in party leader Jeremy Corbyn's frontbench team. The government's Brexit timetable means the UK will leave the EU in 2019, with negotiations lasting up to two years. In June's referendum, UK voters backed leaving the EU by 51.9% to 48.1%.